Some have often said that there was no way that man could have built the Great Pyramids or other rock structures because it is physically impossible for men. Some believe that aliens built the pyramids. This piece of information comes about because of the diagonals lines. The pyramids are right on center for the diagonal line that encases the Delta Nile. This is harder to understand and that is why most people do not give it a second thought. Another reason it is believed that man did not create the pyramid is because that the pyramid is facing the magnetic North Pole. It is lined up exactly. How could Egyptians with no means of geography reading possibly do this? Now comes the theory that something or someone with all the technology could have been the only one to make this possible. That would have to mean that aliens or beings from outer space are more sophisticated than we are. They had this knowledge thousands of years ago. Another mystery is that the sun sets right in the center of the two pyramids, the Great Pyramid of Giza and the neighboring pyramid. Some believe that the Egyptians could not have determined the summer solstice or known about how many days are in a year to do this. The days in a year did not evolve until much later. So, how did the Egyptians build the pyramids to be so precise? Many believe that they did not have anything to do with building the pyramids or any other of the structures around the world. One would have to believe then, that there are life forms more advanced than we are. The mystery behind the pyramids must be recognized. 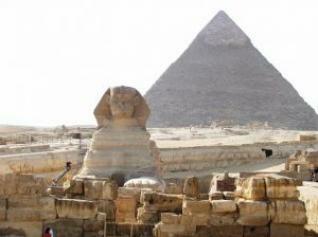 The fascination of the pyramids may be something that was not made by man at all. Another form of live that we once only wondered about or may not have believed might have made them. The Count of Saint Germain - The man who knows everything and never dies!